A creative take on traditional Scottish weaponry, the Blue Gem Harp Sgian Dubh is a stainless steel spear point dagger. The Celtic harp emblem decorates its textured, black composite hilt, and a gemstone inset rests at the pommel. An important symbol of Celtic heritage, the silver tone harp matches silver colored bands that decorate both ends of the sgian dubh hilt. The word Ireland appears above the minute harp. Small serration details the back of this stainless steel blade, lending a sense of utility to the replica Highlander dagger. 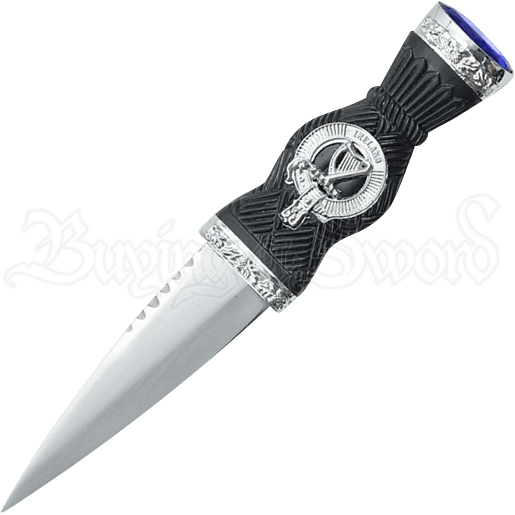 A matching black composite sheath comes with the gemstone dagger, featuring silver tone thistle designs at both its ends. A beautiful way to embrace Celtic history and style, this replica dirk makes a great collectible, reenactment accessory, or gift for a loved one intrigued by historic Celtic culture.